Across the river from Calderwood Castle and to the north-east, perched above a range of cliffs on the Blantyre side or the river, lay Craigneith Castle. This was Blantyre’s castle. The style of masonry suggests erection between 1750 and 1850. The building fulfilled three functions. It provided accommodation for three of the Calderwood Castle servants. Secondly, the upper floor had a large window in each of the three main faces and a wheel stair gave access to a parapet walk. This suggests that the building was a vantage point from which the scenery of Calderwood Glen could be admired. Lastly, it was a decorative adjunct to the whole Calderwood Estate and part of the Gothic philosophy underlying the layout of Calderwood Glen. The battlements visible in the photograph on the top of the round tower were possibly added by Sir John Maxwell to provide a romantic silhouette. The stone used was a local freestone, originally creamy yellow but latterly weathered to a warm silvery grey. Over the years the building fell in to disrepair. Although tolerably intact in 1951, nothing of this size now remains. 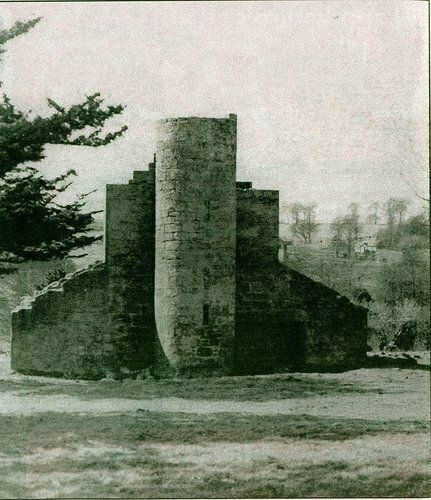 With hardly any stone left, Blantyre’s very own Castle is now largely forgotten about. Pictured above in 1922, it was still impressive 90 years then. On 28th September 2013, i visited the site with the kind assistance of Blantyre man James Brown, who acted as a tour guide. During the very interesting morning, i took these 3 photographs of what remains of Craigneith Castle and he view it would have had. Forgot to check for responses on here. Yes the lands were anciently incorporated into kilbride parish because the calderwood estate is likely older than the parish itself, given the estate was one of the main laird ships near Kilbride and that retainers and servants on the Eastern Blantyre side would have been part of the calderwood estate then naturally this part was incorporated to, an allowed those living within that boundary to attend the parish church of Kilbride for services. The reason for the proposed disjoining was that residents had to travel too far to kilbride church an would have been better attending Blantyre’s. Hi Chris, i was having a quick look through your pictures as i live locally and known the glen since i was a child. I read your comment about the land slip below craigneath and can tell you it happened on a friday night in 1996/7 when there was a tremendous lightning storm. We were there on the friday during the day and on the sat morning the land slip was there. Also unfortunately a cow from the field above also found its end there that night too, which was heard mooing on the night of the storm. Hi Chris. Thanks for this. I’ve been following your excellent work at Calderwood, Calderglen and it’s surrounding areas for a couple of years now. You’re a real inspiration and very motivational when i see your dedication and research. I find the whole Crossbasket and Craigneith area really fascinating, especially as i live quite nearby in High Blantyre. I’ve heard rumours of a Blantyre Castle, but never had any proof of such a grand building existing. Is there documented evidence of a castle at Craigmuir? (It would certainly have had a magnificent vantage point!). I think you may be right about Craigneith still being part of East Kilbride. When i blogged the above post, i had in mind a transcript of a document i have from 15th December 1634. It is an extract Decreet by the Lords Commisioners of Surrenders and Teinds, which separated and removed the lands of Crossbasket and those fields East of the Rotton Calder at Craigneith , disjoining them from East Kilbride and transferring them into the Parish of Blantyre. The Summons was raised by Patrick Archbishop of Glasgow and witnessed by John Heriot minister of Blantyre along with most of the heritors of Blantyre (listed in detail). However, it would appear the decreet was never carried out and i’m at a loss now as to why that would be, and Criagneith and Crossbasket do still officially fall within East Kilbride’s remit (despite opinion of local residents to the contrary). Fascinating stuff!! East Kilbride, and was an 18th century folly which was castellated, but instead of being a castle was a large house. The true castle of Blantyre was a bothwell castle-sized fortress to the east of this site close to Craigmuir Road.